Having a referral can help you stand out from the crowd when you apply for a job. Hiring managers and recruiters will likely take a closer look at candidates with whom they share a mutual contact, and for good reason: studies have shown that hiring through employee referrals results in faster, cheaper, and more effective hiring than relying on job sites. Referral hires also tend to get up to speed more quickly, fit in better, and stay with the company longer. Mentioning your referral and shared connection in your cover letter can make the difference in helping your application get noticed by prospective employers. It also gives the hiring manager some context for your work background and provides additional information about you. A referral cover letter mentions a mutual connection when applying for a job. You might be referred by a colleague, a friend, an employee at the company you’re interested in, or even your college career office. 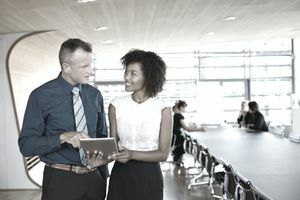 Having a referral name to mention in your cover letter helps the hiring manager understand the shared connection you have with them or their employer. It also helps relate your experience to the open position and depending on how you know the referring party, can provide some insight into how well you might fit in at the company. Your cover letter provides an opportunity to briefly highlight your education, skills, and qualifications for the job. In addition to mentioning your referral, you'll have the chance to add a few specific examples of why you make the best candidate for the position and share other details not included on your resume. When you use a referral in your cover letter, mention them in the first paragraph. Include the individual by name and describe your connection with them as well. Give a brief account of how you know the person, and explain how they came to be familiar with your work qualifications. In addition, if the person recommended that you apply for this particular position, take the opportunity to mention why they are endorsing you. What specific qualities of yours made them think that you would be a good fit for the company? My colleague Amy Smith recommended that I contact you directly about this position. Amy and I have worked closely in the industry for many years, and she thought that ABC Inc. would be a good fit for my style and experience in sales. She pointed out that as a successful, award-winning salesperson I would be an excellent addition to the sales team at ABC, Inc. This is an example of a cover letter that mentions a referral. Download the referral cover letter template (compatible with Google Docs and Word Online) or see below for more examples. It was with great interest that I learned of the opening in your department for a marketing associate. Your marketing manager, Anna Black, was my supervisor at Catz Marketing before taking her current position with Acme Communications. As she can attest, I bring a unique perspective, and can integrate the many facets of a media campaign. With Anna at Catz Marketing, I worked with a local company to build their business and promote their grand opening. We continued to work with them for the first few years, developing a total media plan and implementing it. Their continued success and recommendations brought other businesses to seek our services as well. My experience with Catz Marketing has prepared me to take on the challenges of working in a national company such as Acme Communications, and I would appreciate the opportunity to meet with you to discuss how I can be an asset to your team. As well as my resume, you will find attached a link to my portfolio. The referral doesn't have to be a business connection. You can ask anyone you know at the company or who has a contact at the company if they would recommend you for a job. Make sure to check with the individual in advance and ask if they are willing to give you a referral. Even if you’re certain they’d vouch for you, giving a potential referral the heads-up ensures that they’ll be ready and able to offer the best possible recommendation, given the job requirements. You can send a letter or email asking for a referral, which gives the person the time and opportunity to think through what they can do for you, and how to proceed. Name-dropping does not come easily to some people, especially if you're already wrestling with how to write about your accomplishments and sell yourself to a hiring manager. For this reason, it helps to look at examples of cover letters, although you'll want to tailor your letter to fit your specific personal and professional circumstances. Remember to include a brief mention of your referral and recommendation right away in your cover letter. This strategy puts the referral in the front of the reader's mind, giving them context for the information that follows. Next, expand on your strengths and why you're the best candidate for the job. Your cover letter offers a chance to make a strong first impression, since it's likely the first thing a hiring manager sees, possibly even before your resume. Mention brief examples of your successes in the workplace to prove that you are the most qualified person for the job. As with all business correspondence, make sure that you proofread your cover letter for correct spelling and grammar, and check that the information matches across all the documents you submit.